Thank-you so much for all that you have done for our family. I speak for all of us when I say, “We are truly blessed to have you all a part of our lives!” The comments we have been reading over the last week have been a true blessing. This has been a very hard time for us. I hope you know how truly thankful we all are to have you. 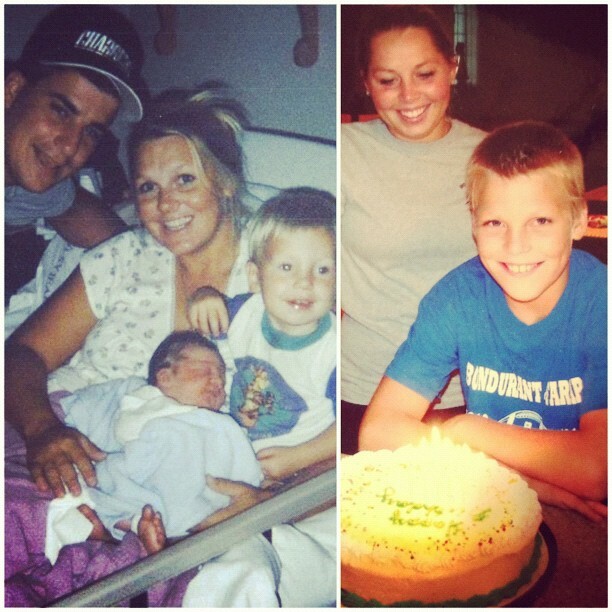 Today would be Joshua’s 14th Birthday. It is being celebrated in a way we never thought we would be celebrating. We thought we would be taking him to the D.O.T to get his permit, because we all know how excited he was to finally get to drive. It has been very hard to go about our everyday lives the last 9 months, but each day we are given new blessings and things to be thankful for. We have had a tremendous amount of love shown from our followers. wildfarmkids.com has about 25,000 hits!! WildFarmKids on facebook has about 2,650 likes/followers!! The picture of Joshua and our mom on Love Transfusion has about 228,000 likes and 5,400 comments!! Love Transfusion has posted a new picture for Joshua’s Birthday. Please share this with family and friends and feel free to comment!! Some may think that we don’t read all of the kind words that are posted on our Facebook and website, but we do. We love reading what our followers have to say. As a family that has lost one of our pieces, we would like you to take the time and love on each other. As parents, do what our parents ALWAYS DID/DO, tell your children how much you love them and how proud of them you are. You never know when your last day with them may be. All you can do as parents is teach your children and love on them. Support your children in any way possible. Never give them the excuse of, “Not right now, I’m too busy, I’m too tired”, because the day may come when they wont be around to ask anymore. We think back on all the silly things that Joshua did, even the annoying sound effects he would always make, and just wish we could have all those things back. Last year for Joshua’s birthday he asked for a guitar. So, my parents got him a brand new guitar, and paid for him to take lessons. He absolutely loved it. He told my mom she was going to be famous for being his mom, and that thousands of people would know us. He said he was going to be a “Rock Star” someday. He said he was going to travel the world and that all of us kids could go too. That my sisters were going to be his back up singers and dancers, my littlest brother would be his drummer, my dad and other brother would do whatever the guys do, that my mom would just be the Mama, and that I would be his manager, because I am good and keeping him in line and making sure things always workout. He said this same thing again the night that he left us. His eyes would light up when he would talk about this. The night he died, my mom was going to record him playing some of the stuff he had learned and made up on his guitar, but it never happened. A couple of weeks later we had his phone and I was going through all the silly videos he had of him and the kids on it and I found a recording that he did of himself singing. It was amazing. I wish he could have finished it, or kept singing more. The only line that he recorded was, “When I was young, I met this girl… I always thought she would rock my world.” I love listening to it over and over. It is the little memories that we are finding of him everywhere. He was and is truly a very special kid and has touched so many lives both when he was here and now. Please keep doing your part in spreading the awareness. You can share our website or pages to help put an end to this. We know we need Joshua here with us, but God needed him more. All we can do is know that we will see him again someday. Have a blessed day and always remember to love each other the way God loves us. That is how Joshua lived. Happy birthday, Joshua. And to you, his family, please know there are many of us who share this incredibly difficult journey with you. Aug 17 is the 4th anniversary of the day my daughter Kerry became a resident of her mansion in heaven. Her birthday and so many other dates have been really tought to handle, but the intensity of the grief diminishes with time. I will keep you in my thoughts and prayers as I do so many other families I’ve come to know since we started down this very difficult road. I am so sorry you too have to bear the pain of losing a child. It has been 7 years now and yes we now celebrate what we had instead of focusing on what we lost but we also have friends and family who have helped heal the our pain .I wish you and yours a day and many more to come filled with priceless memories that will never fade. I was so sorry to read your story. My heart goes out to you and your family. I am also living your pain. I lost my youngest daughter to cervical cancer. It will just be a yr. on Sept. 3rd. She had a horrible journey with cancer that lasted 2 yrs. She died in my arms leaving behind a husband and 2 little girls, ages 7 and 9. I know my daughter was allot older but the pain is the same. They say time heals. I am waiting.No one can share your pain unless they have been there. There is no pain you will ever experience as the pain you are now.You just get up every morning, you keep breathing and know that your darling son would want you to go on and live. We have to remember that their lives are beautiful now because they are happy and whole and no pain. They are at home in heaven with thier Heavenly Father. Your son is playing and doing all the fun things he enjoyed. So you to, have an angel watching over you. I pray for strength and comfort for your family. My name is Robbie Rampendahl. If you would ever like to visit, you can reach me at 712 621 5391. Again I am so sorry for your losss. I saw this on my facebook page for the first time today. If you just need someone to cry with I am you girl. I have that role down good. Take care of yourself. I lost my son 9 years ago (9-22-03). He died 6 days before he turned 12 yrs. He would be 21 next month. I understand the loss and the pain, and I see where it looks like to are trying to make the best of things. I am here if you ever need to talk. I go around and share my son’s story. This is the award-winning film of his story. http://www.vimeo.com/9957697. This has been around the world as a promise I made to my son. Please know that you are not alone in this…. my heart goes out to yall.n ill keep u all in my prayers.happy birthday josh.u were so cute n sweet looking.u look like acool person.n u had agreat family.may you rest in peace .n mom n dad n the whole family will see u again soon.hugs sent to the family.n love from my heart.god bless u all………. Please know that I share your pain and pray for a lessening of yours.He was a wonderful boy. Losing him must be terrible on a daily basis. I hope the memory of such a wonderful child will console you and he will comfort you in your soul. the faith and belief that has seen me through many toils and trials and I pray for your family and their continued faith and belief as well. God’s Love and a big cyber hug to your family. Happy Birthday Joshua!!! This story breaks my heart to see such a tragedy in a family like yours. I am so sorry you are going through this but am so thankful for you opening my eyes to this. i am so sorry for the loss of your son.god knows i know what you are going thru.we lost our son 3 years ago this past feb. it was a sudden thing.i got the call about 5 mins. after i got to work that they was doing cpr on bubba i just lost it right then by the time we got there he was gone .after that every morning going to work i re-lived that morning for a long time .i still do now but not all the time .for a long time i did not have the will to live but i knew my grand children that i was raising needed me.i had a wonderful pastor and church family that would gather around me and my husband and pray for us i know that they definitely touched the throne of god for us.i thank god that they was there for us.god gave us strength to go on .life is not the same .every day bubba is on my mind but life does go .on and it is not like it was.bubba was 42 when he passed away.any body that has not lost a child has no idea how it is. my prayers and thoughts are with you .